Whizzing frozen bananas in to a soft serve ice cream is the raw food community’s worse kept secret, and perhaps, their best advertisement? It is something which I have been doing for years, and posted my version with strawberries back in the hot summer of 2010. I nearly always have bananas in the freezer, I buy in bulk from the market, 30 or so for £1 (surprisingly they are often Fairtrade), peel, chop into chunks and freeze. I throw them frozen into smoothies, or defrost to bake with. (Grapes and other soft fruit also freeze very well for use in smoothies). When we eventually move and no longer have such a cheap market near to us I shall have to buy a chest freezer and come to London by car to stock up every 3 months or so. 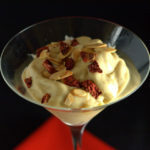 For a touch of indulgence on a cold January afternoon I added a generous dollop of caramel jam to my banana ice cream – dulce de leche would also work well, or peanut butter or speculoos to make a diary free vegan treat. Sprinkled with toasted nuts and strawberry chips from my new dehydrator and served in an elegant cocktail glass to make it extra special it was a delicious and guilt free treat! This barely needs a recipe, you can make this richer by adding cream or buttermilk, but it really does not need it, the whizzed up frozen bananas have a wonderful texture and are quite creamy enough without any additions. If you try this Recipe: Food Processor Banana Ice Cream please tag #FussFreeFlavours on Instagram or Twitter. It is amazing for me when for me when you make one of my recipes and I really do love to see them. You can also share it on my Facebook page. Please pin this recipe to Pinterest too! Thanks for reading Fuss Free Flavours! Your choice of sprinkles – toasted nuts dried fruit, cocoa nibs or even cake sprinkles! 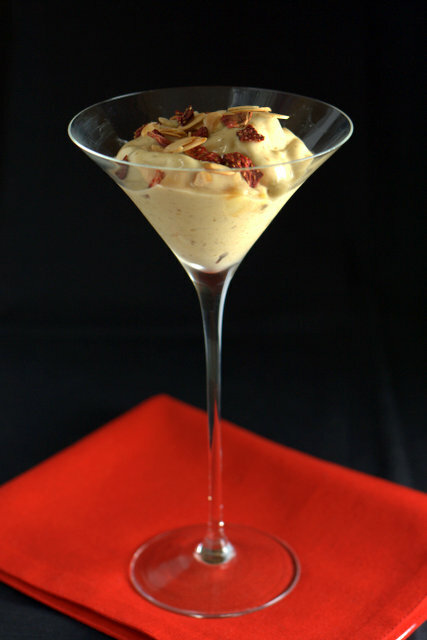 Place the bananas and caramel into the food processor and blend until smooth and creamy. Depending how powerful the motor is this might take a few minutes. (I have successfully made this in both a £300 and an £30 processor). Transfer to an attractive glass, add your sprinkles and serve immediately.